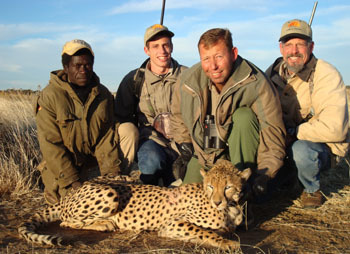 The definition of "Happy Hunting"
Picture top right: A surprise opportunity... Michael with the Cheetah taken on another ranch where it killed some livestock. Brett Campbell, a recent hunting guest and now friend from New Zealand, told us in one of his mails... "Happy Hunting!". This phrase are often used, but during these last weeks, it took on a special meaning for us. and not consider this happy hunting? On top of this, the opportunity to be part of two unique hunts presented itself during the last two weeks and although we could share one of them with Michael Smith, Allison and Kyle from California, the most special opportunity arrived during this week (one week before the arrival of our next guests). We would love to share something like this with any of the special hunting guests we've had in recent weeks - but this is how hunting goes: one never knows when something like this will cross your path. I'm refering here to a special Leopard hunt we could be part of - just yesterday. More about the hunt further down in the Newsletter. 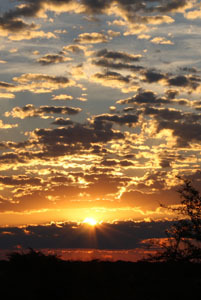 We can just thank and honor our Creator for all the special experiences in life He provides for us. May we see everything that happens to us during our life on earth, as part of His bigger PLAN. And never forget that our only comfort in life, is not about how we can be satisfied by eartly pleasures, but to know that, what we are and what we have, belong to our Lord Jesus Christ. Winter 2009 in the Kalahari was quite different from what we are used to. We've had, more than once, a few quick showers of rain. Although winter arrived a bit late, it eventually came with full force. We now have the lowest temperatures we've had in years in Namibia. It is not "chilly". This week has been real cold. Temperatures of -8 °C (±25 °F) were measured by people in the region. 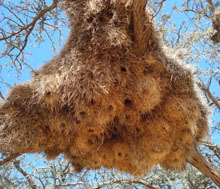 "The Sociable Weaver’s nest is very big - it could be as big as 4 meters deep and 7 meters from 1 side to another. There are many chambers inside, because this nest is the home of up to 300 birds, the chicks included. This nest is made so good, that it protects the many birds inside it, even in weather from blazing hot to icy cold and the birds are very safe from the changing weather. Besides the people, there is another admirer for the weavers and their comfortable home: the Pygmy Falcon. It admires the nest’s structure so much, that, when it goes out to look for prey, it settles in at the Sociable Weaver’s nest and look for an unoccupied chamber. When you look very carefully, you would see the Pygmy Falcon’s chamber by looking for the white dried-out droppings these Pygmy Falcons leave at the entrances. I wonder if the Pygmy Falcon helps the weavers in return for the nice and comfortable home. Probably it helps the weavers to look out for enemies. I really hope so!" 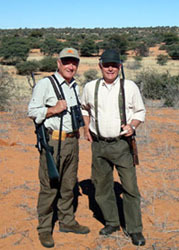 Our hunting season of 2009 started with dear friends John and Marshall visiting from Washington, USA. We had more about their visit and short hunt in the previous issue of our newsletter. The busiest time of our hunting season then kicked off with Stephan Hofmann from Illinois, USA. Steve's Eland and Sandgrouse hunting pictures were already included in the above mentioned newsletter. 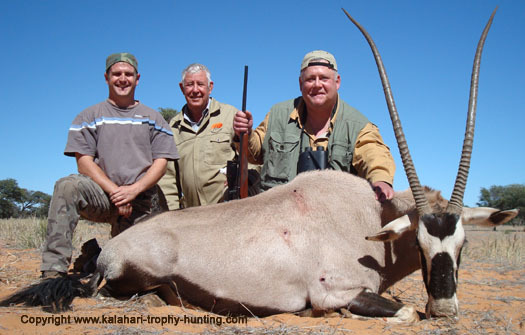 Above: Hendrik, son-in-law Neil and Steve with his Kalahari Gemsbok. 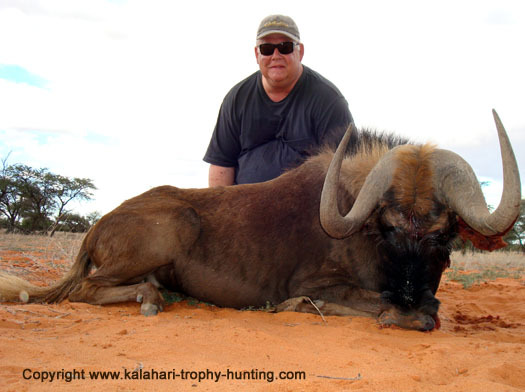 Steve hunted on his last day at Uitspan a very good Black Wildebeest trophy (picture below). Steve wrote a story about his Black Wildebeest hunt on Uitspan. You can click here to read "The Black Bull of the Kalahari". Steve hunted Eland, Gemsbok, Springbok, Impala, Blesbok, Duiker, Black Wildebeest, African Wild Cat, Bat-Eared Fox and Cape Fox. 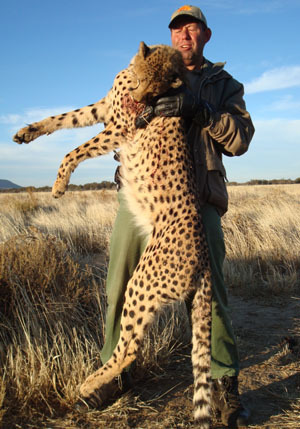 Steve has submitted many African hunting stories on our website. 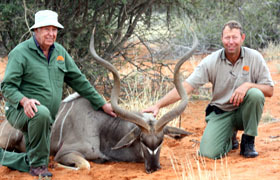 You can read about his hunts and experiences on the "African Hunting Stories"-page of our site. Thank you for your stories, Steve! Next we had Gert and Hennie from Netherlands. This hunt was very special to us... we had the treat to communicate, most of the time, with our hunting friends in our home language Afrikaans! Together we enjoyed the similarities and interesting differences between Dutch and Afrikaans and shared special moments in terms of culture and language. 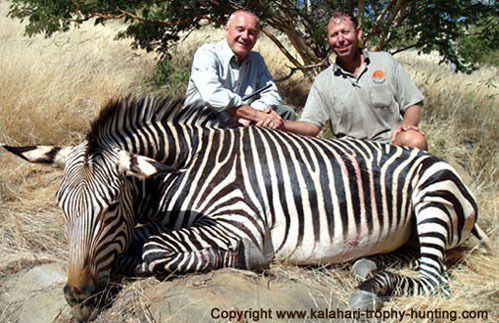 Gert's hunt in Namibia started with a hunt for Mountain Zebra in the Khomas Hochland area near Windhoek. Several conditions on the day of the hunt, made it one of the hardest hunts I ever had. Gert and I followed the Zebra for ± 10 km over rough terrain. All our skills, patience and endurance-abilities were tested to the limit. Thanks also to the fast-footed and sharp-eyed tracker Hakeb who were with us, we found the Zebra 5 hours later. For Gert it was the hunt of a lifetime. We've learned valuable lessons in nature and these are things which make hunting so enjoyable and wonderful. Thanks, Gert, for sharing a great experience! Below: Hennie got hold of a very nice Warthog (see below) in the Seeis-area where we hunt these most beautiful, ugly beasts. Below: Gert's Impala hunted on Uitspan in the Kalahari. 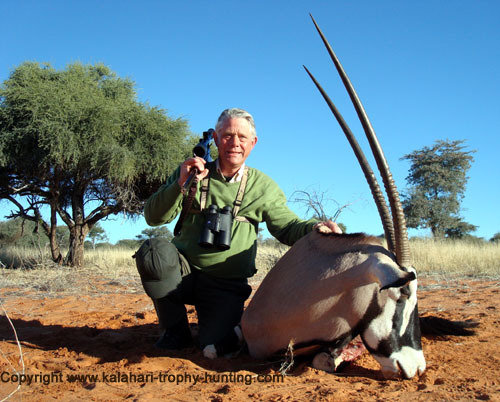 Below: Hennie with his Kalahari Gemsbok. Gert and Hennie hunted Zebra, Warthog, Gemsbok, Impala, Springbok, Blesbok and Black Wildebeest. Frans & Hennie Wessels, Jaco Louw and Gary Doms from Cape Town, South Africa . They hunted for meat and this was their third hunt on Uitspan. Kiwi Hunt: Tom Brough, Brett Campbell with his father Colin and John Anselmi from New Zealand. They took exceptional trophies and we had a very special time together as fellow-farmers and -hunters. Michael Smith with his daughter Allison and Kyle from California, USA. They could share in the Cheetah hunt. Leopard hunter from Arizona. He came with another outfitter to the Kalahari. Michael Smith, his daughter Allison and son Kyle from California arrived on June 28th in Namibia for their hunt with us. Early the next morning we went out to hunt Warthog in a special area near the international airport. The region is famous for huge Warthogs. As we were driving out, Kyle spotted two Cheetah in the grass about 180 yards from us. These Cheetah were near some cattle and we were informed that the owner of the farm had several losses of livestock in recent weeks. It had to be taken out. It was the biggest male Cheetah we've seen in years. About three days ago, we received notification of a Leopard killing stock on a nearby farm. Since we didn't have hunting guests with us this week, we phoned an outfitter-friend and yes... he had a hunter from Arizona, USA who really wanted the opportunity. 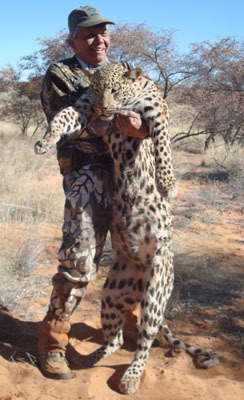 Early this year a permit for Leopard was already issued to this hunter. The hunting group flew in by charter flight and we had to be ready with accommodation for 4 extra people within 2 hours since we've got notice that they are coming. That evening, plans were made and organization were done for early the following morning. 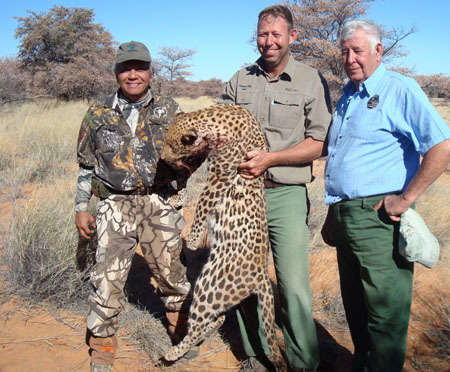 We've shared many hunts and PH and outfitter Kobus asked me and Hendrik to assist them in the tracking down of the Leopard, since the Kalahari is our "territory". Upon arrival on the farm, we found several sheep and Springbok killed and Leopard tracks all over the area. It took us a few hours to find the freshest tracks and after some kilometers of hard tracking in the Kalahari sand, we found the cat... laying down in the grass - ready to jump the truck. The hunter took a precise and good shot. Picture: Hunter from Arizona, USA with the Leopard. Hunting Leopard like this, is to experience the ultimate. The tracking were really hard (I ran ± 8 kilometres on it) but I enjoyed every moment of the challenge. 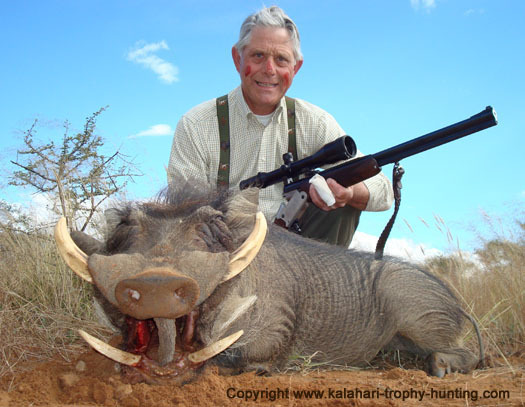 I want to thank my father Hendrik, for his incredible assistance during this hunt. His usual gut-feeling for the possible movements and reactions of Kalahari animals are just unbelievable. Without his motivation and great decisions taken, we may not have found this cat. Above: The hunter, me and my father. We've added a new page to our website recently. 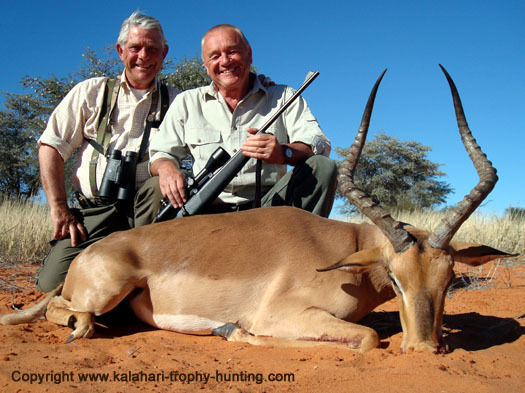 This is the place where anyone of our hunters from now on, can share their Kalahari Hunting experience on the web. You will be able to send your family and friends to your own page on our site where they will also be able to add their comments and ratings of your story (just like our Africa Hunting Stories-page). As time goes by, this page may get more and more stories, pictures and reviews. If YOU hunted with us, feel free to share your experience! Click here to add your hunt. It is obvious that man has come a long way since the day of David. All our labor-saving devices, medical advances, means of transportation, bodily comforts and conveniences make life in the Old Testament look dull and monotonous. But we must not overlook the fact that man has also come a long way in sin! And that includes attacks upon the truth of God's word. Therefore when in Psalm 43:1 David wrote, "Judge me, O God, and plead my cause against an ungodly nation: O deliver me from the deceitful and unjust man," we have a prayer that we ourselves are in great need of presenting to God. Answer: That I with body and soul, both in life and death, am not my own, but belong unto my faithful Savior Jesus Christ; who, with his precious blood, hath fully satisfied for all my sins, and delivered me from all the power of the devil; and so preserves me that without the will of my heavenly Father, not a hair can fall from my head; yea, that all things must be subservient to my salvation, and therefore, by his Holy Spirit, he also assures me of eternal life, and makes me sincerely willing and ready, henceforth, to live unto him." I acknowledge receipt of your letter dated 7 July 2008 in which for the 3rd time, you request that I pay the monies owed to you. I first want you to know that by no means do I dispute my debt and I intend to pay as soon as possible. However I would like to bring to your attention that you are not my only creditor. I have many more creditors,quite as honourable and important as you, and whom I wish to pay too. That is why, each month, I throw all the names of my creditors into a hat and draw one randomly. The one drawn is paid immediately. I hope that yours will come out shortly. PS: I regret to inform you that given the harsh and threatening tone of your last letter, you will not be taking part in the next three draws.